Practical Fire Making Part 4: Get Lit! Timepieces are essential to most things we do. Technology is wonderful. It’s cool. Tech gives us the freedom to do a LOT of things and keeps us connected in this ever-shrinking world. The dominance of GPS and other technology in GPSrs, smartphones, smartwatches, and our vehicles is convenient and helps us live a better life, or at least we should hope it does. Like many contemporary outdoor types with accumulations of “necessary gear”, I have a fewtimekeeping options. I’ve found that smartwatches like the Apple Watch, Garmin and Suunto sport watches are too smart in many ways, and surprisingly lacking in others. The popular and venerable automatic watch, be it a $200 Seiko or a $10,000 Panerai, are very popular and reliable in a manual transmission sort of way… and in theory, a solar powered 6 band satellite synching G-Shock of one of many flavors will never die or be off… They all tell time, but what about having something to help find your way, as well as tell time? The Apple watch falls off almost immediately, with less than a couple days of GPS use without charging, and no built-in compass. The most bell and whistlified watch currently available can place calls from your wrist without a phone, track and chart your heartbeat and even has maps, but no compass. I enjoy the Apple Watch, it’s a fun piece of tech, but also has significant power limitations once you leave pavement and power connections. The Suunto Traverse is a true outdoor-specific piece of tech. It can map the wearer in real time or via preloaded tracks, has a great compass, tells the rise and set of the celestial bodies, measures the barometric pressure and alerts the wearer when a storm is coming, and the Alpha version even drops a GPS marker if you fire a shot while in hunting mode. A Suunto Traverse Alpha will last pretty easily for about a week if the GPS capabilities are used sparingly. Once the batteries of the smartwatches are dead, it’s up to a G-Shock or an automatic. Strictly for timekeeping, the virtually bulletproof 6 band satellite solar powered G’s win the outdoor overall gold medal, but most of them can’t point you to the north (which has changed on many models these days.) So it’s back to the traditional timepiece, again. 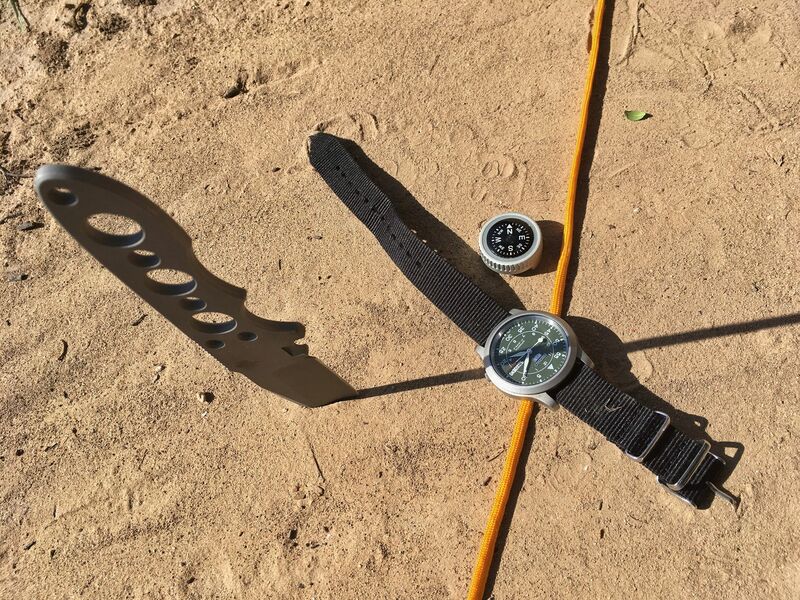 A good old-fashioned Timex or any analog watch can point you to the South and North, and it’s cool and easy to learn how to use your analog watch as a directional helper. 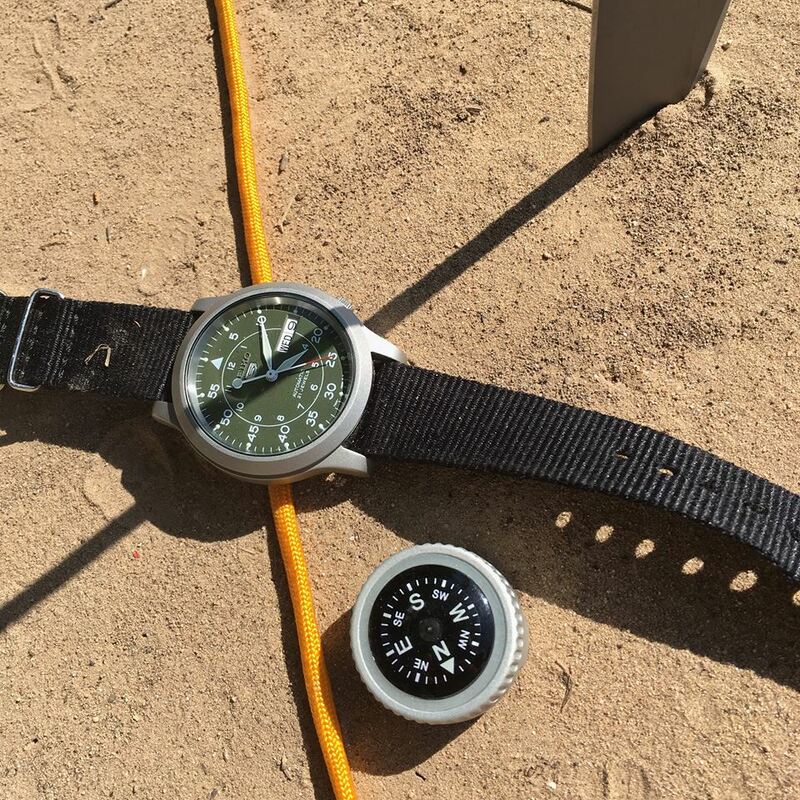 I carry a compass – if you don’t have one of the PDW Expedition Button Compasses or something similar like the Suunto Clipper, you should – especially if you spend any time off of the pavement on the green and brown parts of the map. If I find myself out on walkabout in a rare instance with no tech, no compass, and no handy helpful Eagle Scout and I need to know the basic cardinal directions, it’s likely I’ll probably be wearing a good old mechanical diver or field watch – and that’s all I need. 1. First, we must consider the time of year. If you’ve sprung forward but not fallen back, you’re in the artificial time construct of a long-lost agrarian society we mistakenly call “Daylight Savings. Set your watch to reality (back an hour) for more accurate results. 2. Take off your watch so you don’t have to perform any antics that prove your flexibility or lack of it. Hold it flat in your hand. 3. Align your body and watch so that the hour hand points directly toward the direction of the sun. 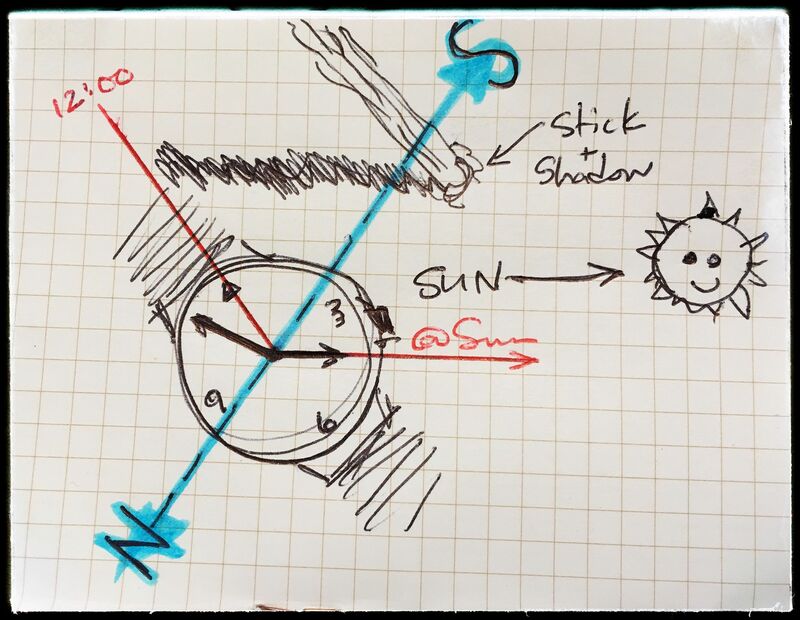 If you really want to get accurate, put a stick in the ground and point/align the hour hand at the sun in the line shadow of the stick. **At** the sun… not with the shadow. 4. Look at the angle formed between the hour hand and twelve o’clock. 5. Imagine a line that bisects the angle created by the hour hand and twelve o’clock. This linewill point south, which means magically, that the other end of it points north! Viola!